British statesman Sir Stamford Raffles - the city's founder, affectionately remembered as the 'Father of Singapore' - originally landed on the north bank of the Singapore River. An agent of the British East India Company, he made Singapore a free port and the busiest trading stop between India and China. These days, the Raffles Landing Site is a popular meeting point to board a scenic cruise. Lean back and listen to the animated audio record of Singapore's history while enjoying the magnificent views and striking contrasts of charming shop houses standing shoulder to shoulder with impressive skyscrapers. It's a great and fun outing for all ages. In its earliest days, the river's banks were lined with rows of small warehouses, storing the goods coolies unloaded from ships that arrived from China, Indonesia and later Europe. Many of these ware- and shop-houses have been partially preserved, though they serve new functions as part of a bustling waterfront promenade, with terrace bars, al fresco dining outlets and fancy clubs along three main riverside quays, each with its own flair and history. Robertson Quay, located near River Valley, is a local crowd pleaser while being considered as the laid-back version of the busier Clarke Quay. Here, you can find chic wine bars, boutique cafes and an interesting mix of alfresco restaurants. In the past, the quay was used to load and unload goods while the merchants' children would jump into the river for a cooling afternoon swim. A short stroll along the river leads straight into the heart of Clarke Quay. Formerly the center of trade and busy with noisy cargo crowds, much has changed while the atmosphere is still as eventful and energetic. Today, it's the tourists and after-work crowds that fill the place, re-creating the lively ambiance of the past and transforming the former dock into the most popular nightspot in town. Quiet during the day, it becomes a maze of restaurants, bars and clubs in the evening, with the party going on well until dawn. The historic Boat Quay stretches all the way from Clark Quay to nearby Marina Bay. But instead of the heavy-bag carrying coolies that used to characterize this area, it is now an attractive pedestrian walk dotted with restaurants and art installations. Combine a dinner with a romantic stroll along the river and admire the carefully restored facades of the colorful shop houses that once where used to store spices, rice and coffee. Look out for the colorful graffiti at the underpasses along the way featuring modern interpretations of the Singapore River history. There is also a contemporary sculpture, known as The Bird or The Fat Pigeon by renowned artist Fernando Botero near the UOB Plaza, one of the tallest buildings in the city. And across the river, below the Supreme Court that looks like a spaceship, is the white statue of Sir Raffles. One of the major sights and attractions along the Singapore River is the Asian Civilisations Museum (ACM). Among the museum's five main galleries is one devoted to the Singapore River and its glorious history - there is no better place to gain an understanding of the river's storied past. Other galleries specialize in South-East Asia, South Asia, China and West Asia, providing a well-integrated picture of Singapore's rich heritage. Besides the countless restaurants, bars and art installations, there are also several attractive events such as Tuesdays by the River, offering free night yoga sessions held on the beautiful Read Bridge and an organised pub crawl. 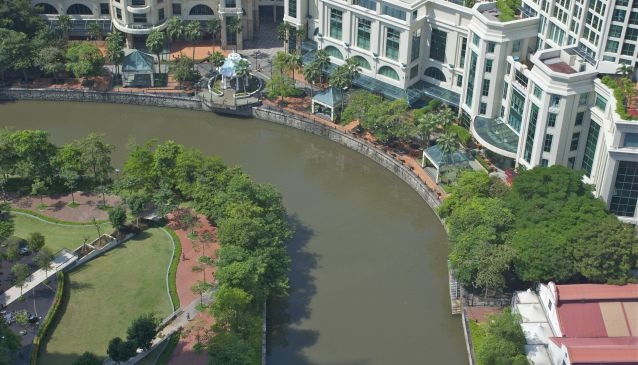 The area on the other side of the Singapore River, starting right at the back of the ACM, the so called Civic District, is one of great historic interest, revealing much of the local history and culture. Watch our virtual tours and video of Singapore River and soak up the bustling vibe.